ioSafe has long been building NAS boxes that can take some serious, real-world abuse. We’re talking water submersion, or something even more severe, like a house fire. What could make a solution like that even better? Synology’s DSM software on-board sure doesn’t hurt. With the 214 dual-bay option, that’s just what we’re dealing with. In past reviews, we have spoken to the importance of backing up your data more times than I can easily recall. Let’s just call it every single storage related article. In each of them, we mention that hardware failures can happen at any time. While there are usually signs of impending failure, sometimes our gear just suffers a genuine mechanical failure. It occurs more frequently with gear that contains moving parts but from time to time, components such as CPUs and RAM can fail just as easily. When it comes to our data: our photos, music, resumes, etc… it matters little if something like our CPU fails. As long as the hard drive is intact, we remove it from computer A and connect it to computer B. Assuming we don’t have to fight pesky but vital permissions, access to our data is simply a few clicks away. That being said, how many of you have plans for the inevitable event that your hard drive suffers a mechanical failure? How many of us have plans for a personal disaster such as fire or flood? On Christmas Day, 2009, Senior Editor Brett Thomas posted his thoughts on the ioSafe Solo. In that review, he took a close look at the “disaster-proof” external hard drive, both from a design standpoint and from a feature set as well. When I say feature, I mean that he set the thing on fire. By that, I mean he set it IN a fire… semantics, right? After all of that, he soaked the external drive in a 5-gallon bucket of water for two days. Finally, and for kicks, once removed from the water he gave it a solid wallop with a sledgehammer. At the end of his review, the ioSafe Solo earned an Editor’s Choice award for its incredible ability to keep the data contained within safe when exposed to realistic home disaster scenarios. Brett was impressed by the device at the end of 2009 so when ioSafe reached out to us at the beginning of 2014 about taking a look at their newest NAS offering, the ioSafe 214, we jumped at the opportunity to work with their hardware once again. Making things even more exciting, the ioSafe 214 is powered by the outstanding Synology DSM operating system and it should be no secret at this time how big of a fan I am of that platform. My initial reaction to seeing the ioSafe 214 was that it was incredibly heavy. Approximately 28 pounds if we’re talking numbers. While certainly not the heaviest delivery of the day, our UPS delivery guy certainly earned his pay carting this thing up our steep driveway and to the door. Once unboxed, the NAS looked utterly unremarkable except for its significant bulk and weight. Housed in an all metal black chassis, the ioSafe 214 is lined with over an inch of ceramic and plastic. This is where the NAS derives its thermal protection properties. 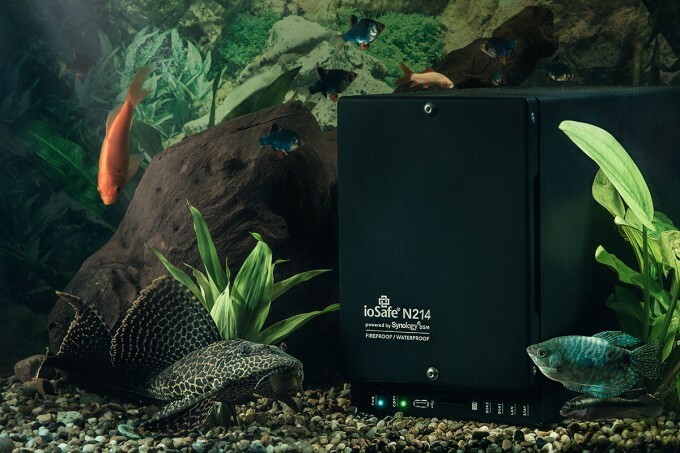 The ioSafe 214 name alone should ring familiar for many who follow the NAS market. Given that ioSafe has chosen to use Synology’s DSM (DiskStation Manager) to power the NAS, one can easily surmise this device is an actual DS214 in the ioSafe hardware “vault”. Since the last Synology device we’ve looked at was the DS213+, we are treating this as a test of the DS214 as well as covering all the features that make an ioSafe device what it truly is. With any Synology NAS, all the buttons and I/O ports we have come to expect on the front of their devices are present on the ioSafe 214. Lining the bottom of the NAS, going from left to right, are power and copy buttons, a USB 2.0 port for external device copies, and LED lights for disk 2, disk 1, LAN, and unit status respectively. Sitting just above IO panel, and situated in the middle of the front, is what appears to be a 1 ¼” bolt. The bolt is fixed to the door and has an identical pair at the top, together serving to hold on the thick front door. Like the body of the NAS, the front panel has the same ceramic lining to resist the heat of an external fire. The back of the ioSafe 214 again contains all the features that we have come to expect on a Synology device. Sitting below a centrally located 92mm fan is a set of USB 3.0 ports, a Gigabit NIC, and a power port. To the left of the device, riveted to the chassis is the serial number. Given that the ioSafe was designed to withstand a fire, it seems silly to place the serial number on a sticker that might burn up with the rest of your belongings. With it etched into a metal plaque and riveted onto the housing itself, it ensures your ability to identify the serial number of the unit in the unfortunate event that you need to engage the provided data recovery plan… but more on that in a bit. To get to the SATA drives within, the front panel needs to be removed. Removing this is simple and all that is necessary by the user is to remove the two bolts that hold it to the chassis. This is done by using the provided hex tool. With this removed, there is a second piece that needs to come off as well. This is held in place by another bolt and thankfully the same tool used before can again be employed. When off, we can see a rubber rim that runs along the entire edge of this panel. This is to provide an airtight seal to defend the sensitive drive electronics from moisture. One point to mention, and this is where the design of the ioSafe departs from that of the Synology DS214 is that the drives are opposing in their orientation within the NAS. If we consider the top of a drive to be its metal lid and the bottom being the circuit board, the drives are situated with the tops facing outward. While not a big deal, it does differ from most other NAS devices and as such, deserves a brief mention. Surrounding the drives is an all aluminum housing with many small fins to wick away heat from the drives themselves. It is over these fins that the air from the 92mm fan travels, keeping the operating temperatures within the ioSafe 214 at levels I find very acceptable. In fact, the temperatures of the 7200 RPM drives we tested with stayed under 100 Fahrenheit. For comparison, I have WD Green drives in my personal NAS and they remain around 86 Fahrenheit sitting idle and also benefit from greater airflow. Given that the operating temperature ceiling of the Toshiba SATA drives we are using for testing is at 140 Fahrenheit, the airtight enclosure of the drives should not be a cause of concern as far as temperature is concerned. Finally, to cover the hardware of the ioSafe 214, we can see that it uses the Marvell Armada XP SoC, clocked at 1.06 GHz. The NAS also comes with 512MB of DDR3 system memory. It offers hardware data encryption, supports both 3.5″ and 2.5″ SATA drives up to 4TB each, and has a chassis that includes both a Kensington security slot and the ability to utilize an option floor mounted and padlocked enclosure. That’s all find and good, but what’s covered? ioSafe states that they have you covered in the event of data loss for “any reason”. What if I happen to, say, spill maple syrup all over my brand new ioSafe 214? I do this a lot around the house so coverage like this is a, ahem… sticking point for me. The following list was pulled directly from the ioSafe website and hey, look at that! One thing that ioSafe is proud of is its dedication to your data. While the individual files that you house on your NAS are of no concern to them, that data’s integrity is. It’s because of this, they designed their devices to a level that goes beyond most typical home disaster scenarios. As Brett pointed out in his review of the ioSafe Solo, many small business server rooms are in locations around the office where the noise and heat they put off can be largely ignored by the population at large. In many situations, this might be a basement. Now, I’m no construction engineer but basements are more likely to flood than surface floors and those above them. Whatever the situation, ioSafe has tried to take into account the likelihood of such disasters occurring, and when they do, they have a sound plan to get your data off of the exposed device and back into your possession.